Asics Men’s running shoes have never been apart from the comfort features when it comes to providing hi-tech performance and long-lasting durability. 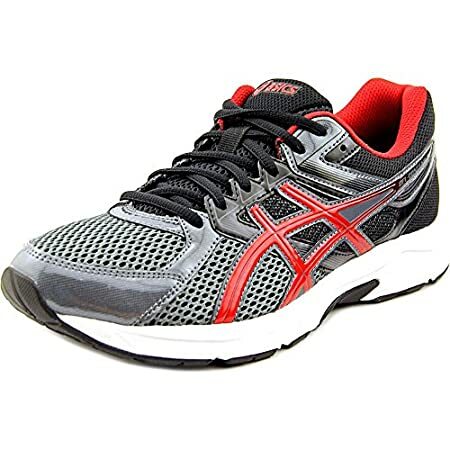 Asics shoes are always in some of the top options that athletes, trainers, and regular walkers would prefer to have for them while on the go. Though it is quite obvious that you should be familiar with the most intricate features of the particular shoe you have decided to buy, you must always beware of the fact, all shoes are not made to match the same needs at the same level. Some are good for one reason and other may for another one. This Men’s Running shoe also comes with its own unique comfort features which are described below. The upper of the shoe is made up of durable, flexible yet sturdy mesh fabric supported by synthetic strips sewn perfectly to fit the foot. The stitches are made to match the strength and power of the shoe to support it without getting torn out. The mesh fabric provides soft supportive upper that is capable to resist wear and tear issues and also allow easy transition of the foot during the walk by flexibly accommodating the upper of the foot and keeps it in place. The outsole is made up of highly durable and flexible rubber that is capable of supporting the foot and keep it firm on the ground no matter if the floor is rough or slippery. Due to its ability to resist abrasion, it would not wear out easily. You can walk or run with confidence while wearing this shoe. The overall insole including the midsole areas is engineered to give the foot the best posture in its natural form so that the bones and the muscles stay easy when it is in the resting position and during the walk, it is supported in the right way. The Gel-content technology offers easy, soft yet very supportive sole for better and easy walk. Without exerting extra pressure on heel, mid-foot and toe area. The shoe is lined with breathable and soft sock liner and the upper mesh fabric constitution makes it easy and comfortable. With a padded collar and the tongue, the shoe comes with a comfortable shoe that keeps the foot snugly fitted and easy in the shoe. The shoe is accessorized with the lace up vamp for better and customized fit that keeps the foot safe from getting turned or slipped in the shoe. All materials including the mesh fabric, the padding, and the rubber sole offer a durable structure that offers continuous support and performance without getting out of form. The shoe is categorized to be a lightweight shoe as it would not feel heavy on the foot despite the padding and a rugged look. It feels easy to wear and offer no hassles even if you have to wear it for hours. The shoe is composed of durable and comfortable materials that give it a perfect structure for better performance. The high-quality materials promise to keep the form and features of the shoe in action for a long time. The shoe is made to match the comfort needs of regular walkers and runners who need to keep their foot easy and relaxed even if they have to work out for hours. The padded collar, insole, and tongue make sure the foot stays relaxed and active all the time. The breathable mesh fabric with the sock liner ensures the foot will stay sweat free and keep the inner of the shoe breathable. The outsole provides rugged surface and offers stable walk and running experience regardless of the kind of surface you have to run on. With lace-up closure and flexible upper, the shoe can fit any foot in a snug way without leavings pace to let the foot turn and keep comfortable as well. The insole supports the foot perfectly keep it in its best form and supports the posture well. The shaft is located approx. low top position from the arch which suits the foot in most conditions. Though, the shoe offers all the features that are required in a supportive running shoe, sometime you may need extra comfort and support in your running shoe. It also depends on the kind of surface you are walking on and the frequency of using the shoe. The shoe might feel less soft due to medium level padding and sole. Overall this shoe is a new entry in the market as customers still have to share the experience as per their own understanding and how they feel. But as per the composition and the features that are easily visible, the shoe offers a stylish substitute for those who are looking for style, comfort and a durable pair of shoe for their running activity. You just have to be careful if you need to get a comfortable shoe as the correct size is the key to get the best experience you need. Since this shoe is available in M and 4E sizes so bulky feet can easily be accommodated in the shoe as it offers sufficient toe box for the correct size of your foot.